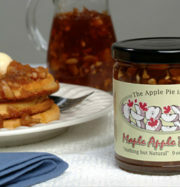 Try my sensational secret recipe Maple Kettle Corn and get enough with this 4 qt. bag to share with friends. Net weight 18 oz bag. Thank you, Jennifer, it iw one of our favorites too. We will be taking bags to the local ballpark. The home of the Vermont Mountaineers.